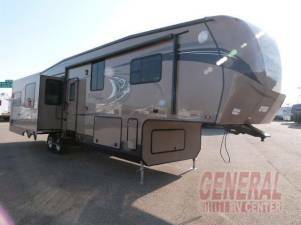 Triple Slide Eagle Premier Fifth Wheel, Rear 2-Lounge Chairs w/End Table, Dbl. Cabinets/Entertainment Center/Hutch/Micro./3-Burner Range/Refrigerator/Pantry Slide, Dbl. Kitchen Sink, Cabinet, Hide-a-Bed/Free-Standing Table & Chairs Slide, Step Up To Bed/Bath, Toilet, Shower, Lav., Wardrobe/Queen Bed Slide, Walk-In Closet, Storage, W/D Prep, Chest, Overhead Cabinets Throughout & Much More.